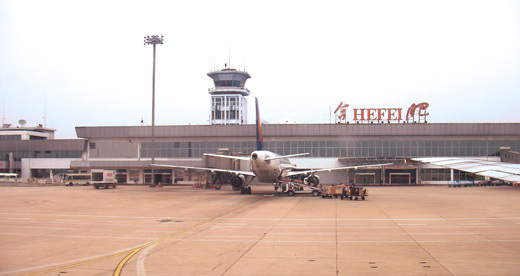 Hefei Luogang International Airport (IATA: HFE, ICAO: ZSOF) is an airport in Hefei, Anhui Provience, in the People’s Republic of China. During World War II, the airport was known as Liuchow (Luchow) Airfield and was used by the United States Army Air Forces Fourteenth Air Force as part of the China Defensive Campaign (1942–1945). Liuchow was used as a reconnaissance base late in the war, with unarmed P-38 Lightning aircraft flying photo-reconnaissance missions from the airport during the summer of 1944. The recon planes moved out at the end of November, being replaced by C-47 Skytrain transports, which used the base as a resupply and causality evacuation airfield until the end of the war. After the war ended, the 23d Fighter Group moved in prior to their return to the United States, along with the 427th Night Fighter Squadron, who left their P-61 Black Widows at the airport before the personnel moved to India on their way back to New Jersey in October 1945. It is suspected that one of the squadron's aircraft is on display currently at the Beijing University of Aeronautics and Astronautics, and two others remain storage. Reportedly, Chinese communist troops came onto the airport and ordered the Americans to leave without their aircraft.